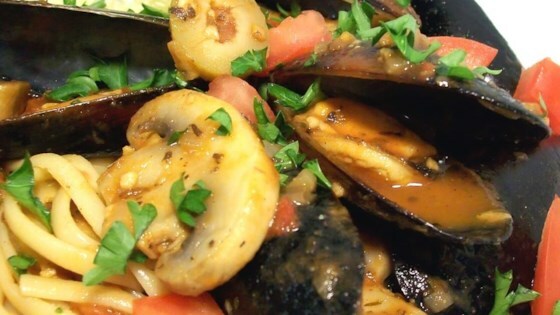 "A tomato sauce recipe for mussels is great if you don't like the usual wine recipes (like me!). There is no salt or butter. Here's a tip to make sure mussels are fresh: tap the opening of the mussel on a hard surface, if the shell closes you've got yourself some nice fresh mussels!" Bring a large pot of water to boiling. Cook pasta in boiling water until al dente, about 8 to 10 minutes. Drain. Meanwhile, heat olive oil in a large saucepan over medium heat. Cook onion and garlic in oil until soft. Stir in diced tomatoes, tomato paste, and mushrooms, and add the mussels. Season with basil, oregano, and tarragon. Cover, and simmer for 10 minutes. Stir in olives and fresh tomatoes. Cover, and simmer 5 minutes. Serve mussels and sauce over pasta. This dish came out great. I used frozen black mussels which worked out nicely. I also added some hot pepper to give it a kick.